As his father was a true racing enthusiast and respectable amateur GT driver, Dylan Derdaele picked up karting at the relatively old age of 14. With limited experience and material, he immediately joined the front in the Rotax Max Benelux league. However, for Dylan it can never go fast enough and from 2008 on he stepped up his game and started in GT-racing. In racing it’s often said that true talent lures in going fast immediately with everything that drives. Whether this is true or not we leave untouched, however with Dylan this is the fact. From sport prototypes to GT’s, from national championships to international competitions, Dylan is always fast from first moment on he steps in the car. His ability to read a new car and adapt to new environments is unseen… In a 10 year period Dylan has left his mark in championships from all over the world (Japan, US, Macau) with the Benelux championship as a pivot in his career. For full race bio please check his track record. Besides racing Dylan is also building a strong reputation as a businessman within motorsport. In an industry that is often known for its haggling and opaque way of doing business, I stick to my word and my balls. With me you’ll always know where you’re at, whether you like it or not. 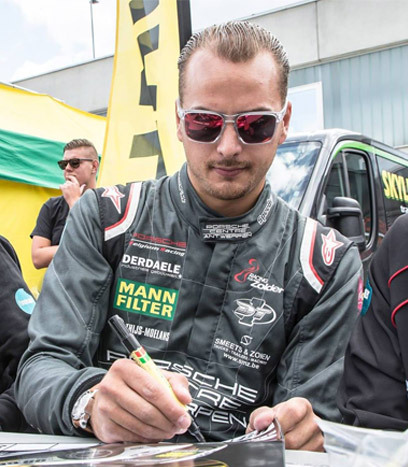 Today Dylan leads the highly successful Belgium Racing team and has helped a lot of talents and professional drivers to achieve the next goals in their career. On & Off track: Balls to the wall!